In a last ditch effort to find a way to get dinner on the table while working from home and going crazy trying to “do it all” I bought my first Instant Pot. Which quickly turned to collecting all the accessories and even buying a second, larger pot for our family. 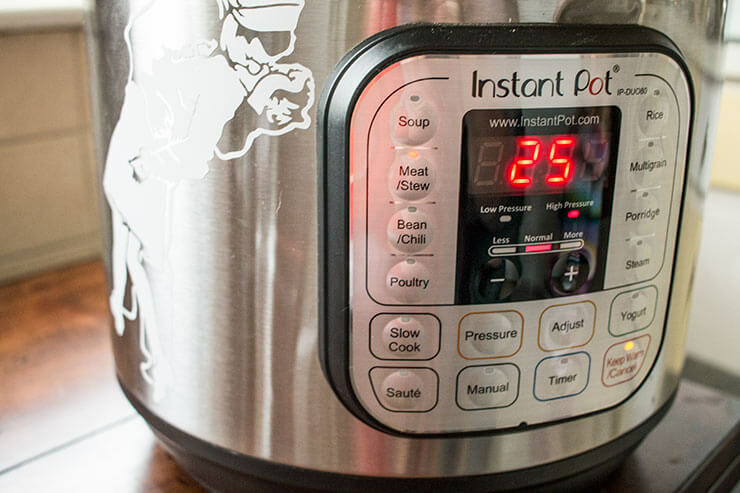 Learn more about your instant pot with this comprehensive guide. It was before they were cool or the must-have, awesome gadget to buy on Black Friday or Amazon’s Prime Day. It was also before I had my third child and learned the true meaning of juggling life. In the years I have had my electric pressure cookers, I have learned a lot. I have purchased a total of 6 pots (though only two reside in my home) and personally taught dozens of people how to use them and rock dinnertime without stressing. I have talked people down from their fears of old-fashioned, exploding pressure cookers. Friends and I have done troubleshooting as to why their meals didn’t come out as planned. And over 7,000 people have joined an instant pot facebook group I formed to share successes and ask questions. But there are 3 main things I wish everyone new to pressure cooking knew and they are the troubles or questions I answer most. 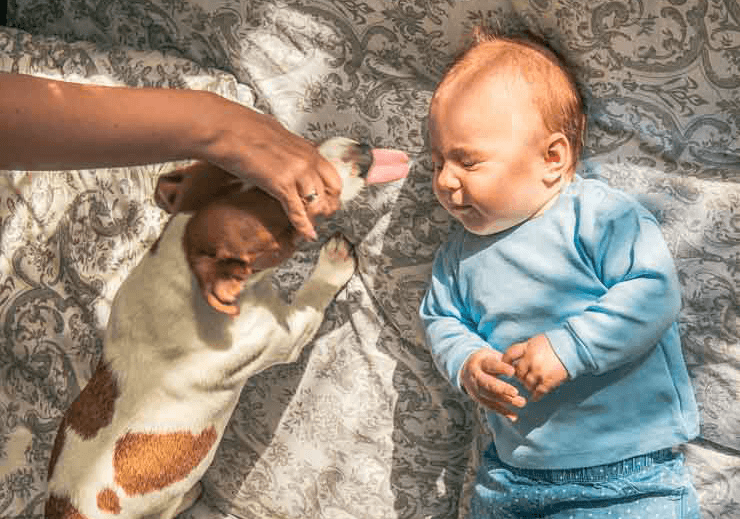 It takes time and hand-holding to get comfortable using an electric pressure cooker. Not every recipe comes out perfect in the beginning and you question yourself a lot. But that’s ok and things get easier. I once got a text from my mom that sounded panicked and asked me to call her. Ultimately she was worried something was wrong with her Instant Pot because it was taking a really long time to depressurize. But I asked her how much was in her pot. “12 cups of tomatoes” she replied. Yes, twelve cups and lots of liquid is going to take MUCH longer to heat up and release pressure than say a meat dish with only a half cup of water. But learning the ropes of using it takes time and a little practice. And like my mom, it’s a lot easier to have someone on speed dial and a best friend to learn next to. Cook times don’t include pressurizing and depressurizing times… but that’s not really a bad thing. 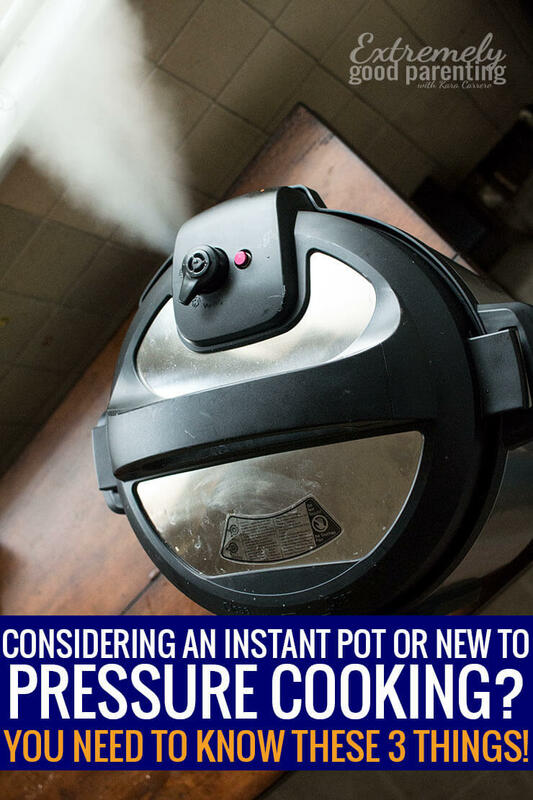 I get that so many complain that the “Instapot” isn’t actually instant since it takes time for the pot to heat up and then take time to release the steam and pressure once done cooking. But two things I like to remind all people using pressure cookers is that 1) even ovens have to preheat and even water has to boil. But also 2) I am not having to babysit food on the stove and can freely walk away to clean my house, tend to my kids, or otherwise manage my busy schedule accordingly. And that’s HUGE. So even if a meal is the same cook time as a traditional cooking method or if has to cook for 20 minutes while taking the extra 15 to pressurize (and maybe 15 more to depressurize if I am not quick releasing), I’m saving time in that I am accomplishing so much more. Even if that accomplishment is that I am doing nothing in that time. Pressure cooking tends to allow for a healthier lifestyle. Yes, I totally understand some people buy it for the cheesecake and dulce de leche awesome sauce. But the simple fact that I can make firm veggies like Brussel Sprouts super tender and flavorful in 3 minutes instead of 15-20 on the grill means I am more inclined to cook them. Or because I can cook pretty much anything from frozen or beans without being soaked means that having mom brain and forgetting to thaw something healthy doesn’t prevent me from actually making it that night. The cost of an instant pot really for me is more of an opportunity cost not necessarily money out of pocket. If it means I can do Whole30 with my family, eat more of a Whole Food Plant Based lifestyle, or simply add more veggies to my kids’ plates because it’s just as convenient as “convenience food” then you better believe my money is on the table and there is no regret in my mind. To get recipes click here and we’ll add you to our Instant Pot mailing list. 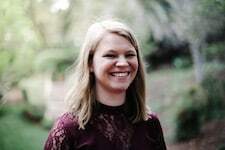 Need help learning the Instant Pot or want to help family & friends? Check out the preview for this awesome FREE downloadable cheat sheet. Simply print, possibly laminate, and post in your home to remind yourself and/or help teach others in your family to use your new favorite kitchen appliance. 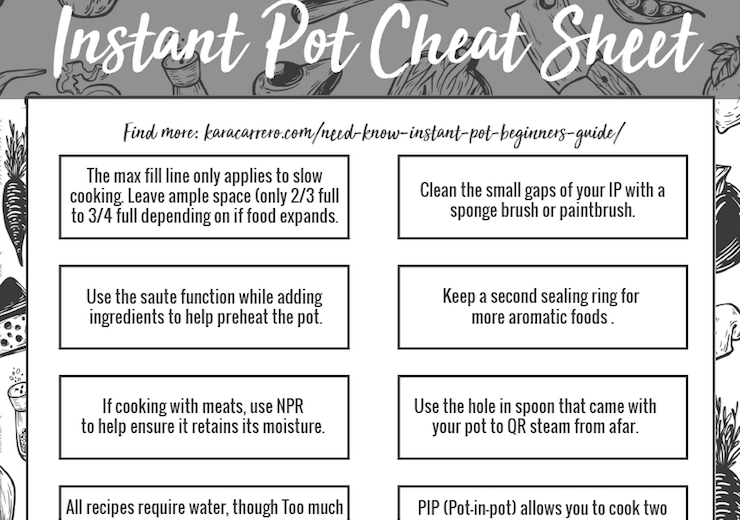 It has 14 Instant Pot tips and tricks! And is the perfect list to help you or a loved one feel a little more comfortable using their pressure cooker. Plus, downloading will get you some great recipes to try right in your inbox! Yes, please send me the free IP cheat sheet! I am new to cooking with the instant pot.Need all the help I can get.Thank you. We send freebies and recipes you won't find ANYWHERE else on our site to our subscribers and this is one! We hope you enjoy this hummus recipe. Simply input your email below to get the instant download.